What Are A Father's Parental Rights Following A Divorce? Home > Cusody/Child Support > What Are A Father’s Parental Rights Following A Divorce? Now more than ever Fathers involved in divorce proceedings are fighting and winning cases regarding parental rights, custody, and child support. It is important to note that whether you are a man or a woman it is imperative for you to understand your rights, and what you are entitled to. It has been a common misconception that fathers are at a disadvantage when it comes to child support and more importantly child custody cases. This at one time was true. Years ago the courts showed preferential treatment to women, which reflected the societal notion that the best place for a child to be was with the mother. As a father you have the same parental rights as any mother. Thankfully for fathers this notion has changed. 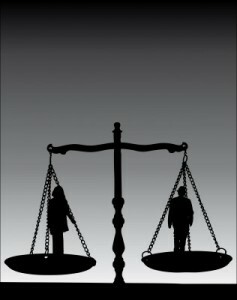 Today, the law does not recognize any difference between men and women. This is an important fact that is often overlooked. It is important because many fathers feel like they are at a disadvantage for simply being a man, and this inhibits them to fight for arrangements following a divorce that they may be entitled to, such as child custody. Family law attorneys are reporting that in the majority of their cases that most of the fathers are awarded custody, and decision making over the children, as often as the mothers. While it is easy to speak in generalities, it is important to note that every case is different. Each case has a specific set of circumstances that may ultimately determine the decision making process. If you are a father who is concerned about being awarded custody of your child/children, guardianship, or even worried about losing your parental rights, it is helpful to first think of how involved you have been with your child/children. As a father it is crucial for you to examine your role in your child’s life when considering your chances at custody or guardianship. You need to be able to ask yourself some key questions, and be able to answer them honestly. Ask yourself: Have I had an active role in my child’s life? Do I have an active interest in my child’s life? Have I had an influence in my child’s life? Do I have a solid rapport/relationship with my child? Does my child want to live with me? Do I spend time with my child regularly? If you answered no to the majority of these questions, then it may be difficult for you to establish your role as a responsible custodial parent when a court is determining where is the best place for your child following a divorce. However, if you are a father who is an involved father then you should know that just because you are a man, you are not at a disadvantage when it comes to guardianship or child custody. You may be asked to prove your involvement in your child’s life. While it may seem insulting to prove your participation in your child’s life, it is imperative in your case. Knowing what to expect is a vital step in preparing and winning your case. Compiling letters from individuals who have observed your regular involvement in your child’s life is one way to prove your involvement, and protect your character. For instance, letters from dentists or doctors will show the court that you have been to medical and dental appointments for your child at a pivotal time in your child’s life. Along with letters from physicians or dentists, you may also have medical records that show your presence during an operation, or even a routine medical examination, which will prove helpful in your case. Having a witness verify your involvement is also a key component in proving your consistent participation in your child’s life. It is best to have non-partial witnesses, meaning your brother or friend is not the best choice. On the other hand, the soccer coach who can verify your presence at games, or a teacher who can attest to you being at parent-teacher conferences is a great non-partial witness. In many instances there are also files or records that your child’s school will have that can prove your involvement. These are just some examples that will prove exceptionally helpful in your case. As previously mentioned, every case is different, but there is one common denominator in any case-knowledge is power. Having a clear understanding of what your rights are, and what you are entitled to is crucial in the outcome of your case. Going through a divorce, or child custody battle is an incredibly stressful time. However, it is a critical period that will shape and impact your life in many different ways. Do not face this difficult time alone. Contact a family law attorney who will give you a solid foundation on what your options are, and the best way to get the results you want.